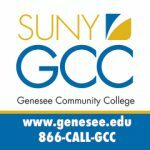 The Genesee Center for the Arts at Genesee Community College has released its spring 2019 line-up of events and opportunities, and it is going to be an emotional, fun and powerful season. First, the Roz Steiner Art Gallery at GCC will display a collection of paintings by Muhammad Zaman entitled “Finding Amal” from January 22 – February 22, 2019. Amal, meaning ‘hope’ in Arabic, is what Zaman hopes to inspire through his work. “Finding Amal” features compositions of urban calligraphy that combine the three languages that are the cornerstones of the artist’s culture: Arabic, English and Bangla. Each individual canvas expresses a word, phrase or concept as if they were messages dedicated to the entire human race. The artist will lecture on January 31, 2019 at 12:30 p.m. and receptions will follow at 1 p.m. and 5 p.m.